http://www.borderlands-books.com In the past the space had been an office, an ice cream store, and was originally the servants’ quarters for the building next door. 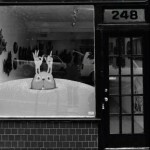 The character of the building helped shape the aesthetic of the store, a style that owner Alan Beatts calls “Minimalist Victorian”. During the course of getting ready to open, Alan learned how to build bookshelves, refinish wood floors, and more about plumbing than he ever wanted to know. Borderlands began as a used-only bookstore, the shelves stocked with about 6,000 books (a combination of Alan’s personal collection and some great collectibles and paperbacks purchased from the extremely helpful folks at Know Knew Books in Palo Alto). The store rapidly became a meeting place and social center for readers and authors, and hosted many special events. The earliest events at Borderlands were readings with authors Peter Beagle and John Shirley. In the Spring of 1998, the store began stocking new hardcovers, with a special focus on independent publishers. (To this day Borderlands has one of the best selections of small-press genre titles in the country.) Near the end of that year the store began carrying selected new softcover titles. In February of 1999, Alan hired Borderlands’ first employee, Jeremy Lassen, who still works at the store every week despite his position as publisher of Nightshade Books. 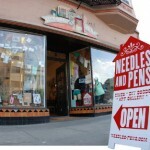 In March of 2001, the management learned of an opportunity to move the store to a much larger space in the Mission District. Since the Mission was where Alan had wanted to open originally and the store was starting to get a bit short on space, this seemed like a golden opportunity. The owner of the used clothing store Captain Jack’s on Valencia Street wanted to close his store and move to Los Angeles to become a stand-up comedian. Borderlands took over the lease and bought the inventory from the clothing store and for several months all of the booksellers did double duty — selling books at Laguna Street and used clothes on Valencia! When all the clothes were gone, they set about transforming the place into Borderlands. Alan built almost all of the bookshelves you’ll see in the store photos in our Gallery , and he and the staff put in countless hours refinishing the floors, repainting the livid pink and green walls to the current, more subdued antique white, building additional walls, removing large piles of moldering jeans and other debris from the basement, and otherwise becoming temporary handy people to make Borderlands look the best it possibly could. On Tuesday, May 8, 2001, Borderlands opened in its current 2000 square foot space at 866 Valencia Street. Shortly thereafter the store received an award from the San Francisco Bay Guardian for being The Best Sign of De-Gentrification in the Mission. 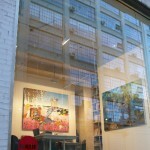 The store has been mentioned by AAA’s travel magazine VIA, Gourmet Magazine, and the Washington Post. Borderlands currently stocks nearly 14,000 titles. 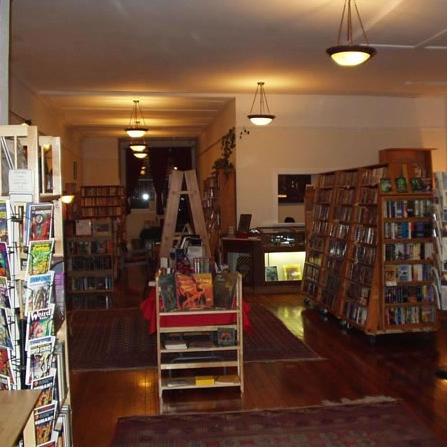 The store continues to expand and today is regarded as one of the premier genre bookstores in the country.